(først og fremst ryolitt og dasitt). 1. A steep-sided mount that forms when very viscous lava is extruded from a volcanic vent. 2. 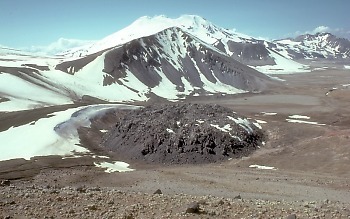 A steep-sided mound that forms when viscous lava piles up near a volcanic vent. Domes are formed by andesite, dacite, and rhyolite lavas. 3. A steep-sided mass of viscous (doughy) lava extruded from a volcanic vent, often circular in plan view and spiny, rounded, or flat on top.